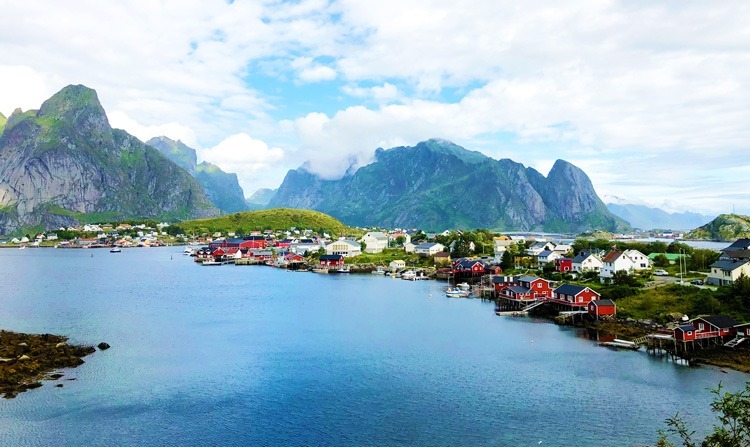 The Lofoten Islands in Norway are the perfect destination for a fun family adventure filled with gentle cycling and some of the most incredible landscapes in the world! 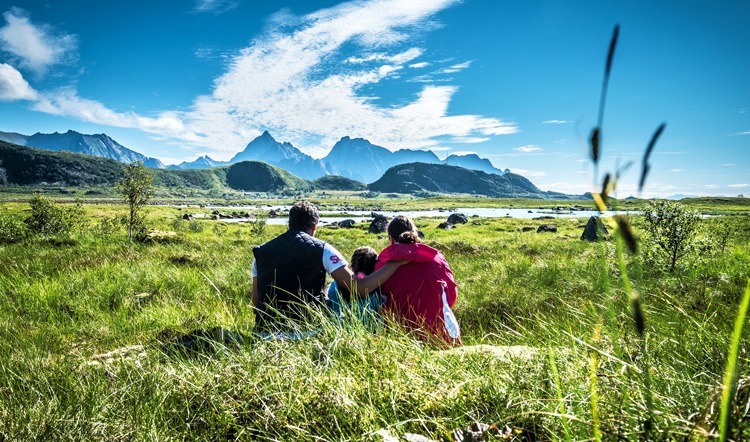 Engelien, Cor and little Babette embarked on this magical tour of the islands this summer and came back not only with incredible memories but also with a video and beautiful photos to share. 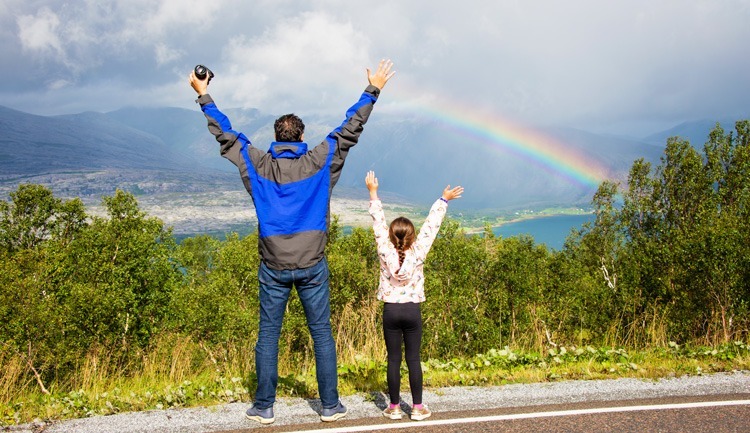 Their Customer Competition entry was a huge success in 2018, winning a whopping £1,250 worth of Skedaddle vouchers to spend on their next holiday with us! ‘Last summer we went to Europe for a change of scenery for our summer vacation. This time we went to Norway. First few days in Oslo, then flying north to the village of Bodo high in the Arctic Circle to catch the boat to the Lofoten Islands. Unfortunately, we were too late to be able to experience the midnight sun, for that you have to go from mid-June to mid-July. Nevertheless, the days were certainly long enough for us to enjoy it all! The landscape is breath-taking. 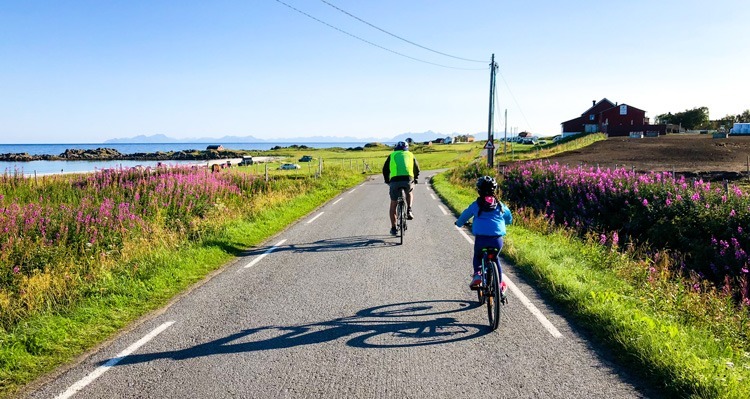 We were certainly not looking for a beach holiday this time and have chosen an active holiday instead – a family cycling holiday with Saddle Skedaddle. They moved the luggage for us from accommodation to accommodation, explained and showed the route, and for the rest we were free to do whatever we want. It was a superb week! 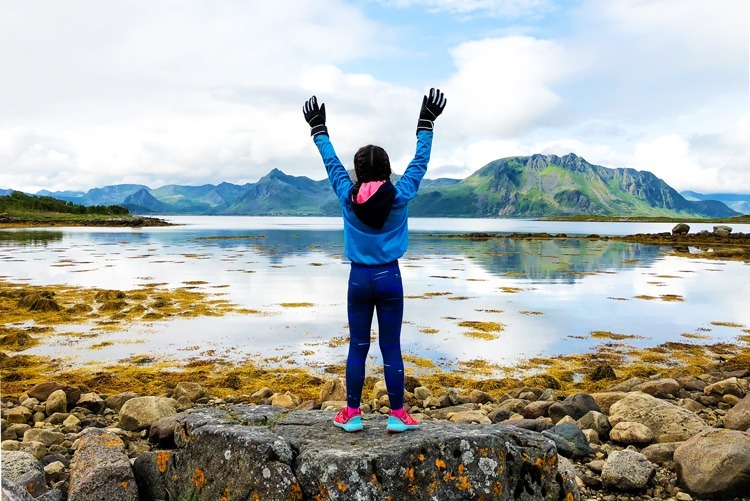 It started with a 6-hour boat trip on one of the famous boats of the Hurtigruten, sailing along the entire Norwegian coast to the far North, near the Russian border.Once back to the Lofotens, our first stop was the village of Svolvaer, where we spent the night in a typical Norwegian fishermen’s cottage. The first cycling stage was a total of 26 km (16 miles), a nice start! The cloudy skies were great, and the sun rays were beautifully visible over the water. On the way, we stopped in a nice village for a hot chocolate and visited a small aquarium. The second day went from Henningsvaer to Gimsoy, 35 km (22 miles) of cycling. We had beautiful weather on this day. We had to stop many times, because all the views were so beautiful! We also had another wonderful place to spend the night with a view of the sea. The third cycling day was the longest. The standard route was about 60 km (37 miles), but we have added a nice scenic loop to it and the day got even longer. Of course, we wanted to do as much as possible to experience it all! Everything was well planned and organised in advance and we had a good tag-along bike ready to go on this day. It was a great route and we were very lucky with the weather – a beautiful blue sky all day! Finally, we have arrived at the lodge where we would stay for the next 2 nights. On the fourth day of cycling, we first boarded a small boat in Ballstad that took us to the next fjord, so that we could cycle from there. This was another beautiful bike day! We visited another small old church in Flakstadt, and even saw the traditional racks for the drying of cod (Gadus Morhua) that Lofotens are famous for. On the last part of the trip, we slept in accommodation on a small island, which were again, typical fishermen’s cottages that now function as B&B’s. However, this time not traditional red houses – but yellow! We were told a beautiful story of a boy long ago who wanted to impress a girl from the island next to him. He painted the houses on his island yellow, and the story ends with them getting married. Everyone on the Lofotens knows the yellow houses of Sakrisoy. The last day of cycling we kept short but got to admire the very beautiful bay that you can see on a lot of postcards. Feeling inspired? 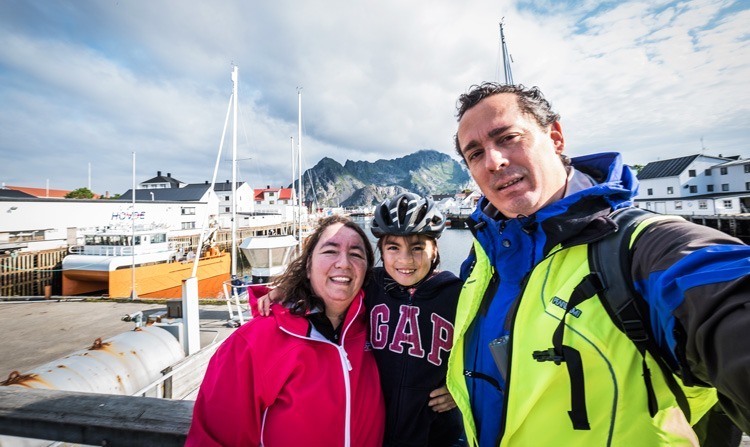 Lofoten Islands is just one of our itineraries for families – check out our full range of family cycling holidays to find your next adventure. We have both self-guided and guided options, so whether you want to be shown the way or go at your own speed – we have just the right journey for you!